Kristin, one of the trainers where I work out, asked if I had any good sweet potato recipes . . . that were vegetarian . . . and that could be made in a microwave. Living in a sorority house -- the same one I was in btw, at the same university, just a few years ago, or so it seems -- limits her personal cooking to the microwave. But between school and work, she sometimes has to come up with her own quick and easy vegetarian dishes to fill in for missed meals. Excuse me a minute, I must have drifted off again. Even though I just had my one year anniversary of regularly working out at Curves, the phrase "work out" connected to me in any positive, physical sort of way still sounds sort of surreal! And I'm still sort of in shock that all those things "they" say about regular exercise are true. But they are. I'm living proof. Who knew! So here it is Kristin at Curves! As luck would have it, I had just discovered a delightful sweet potato recipe, easily adapted to microwave preparation for vegetarians. Forget about every ooey-gooey-sticky sweet potato recipe you've ever tasted at holiday meals. Instead, think light. These mashed sweet potatoes have bright citrus-spice flavors that would be perfect for morning, noon or nighttime meals or snacking. 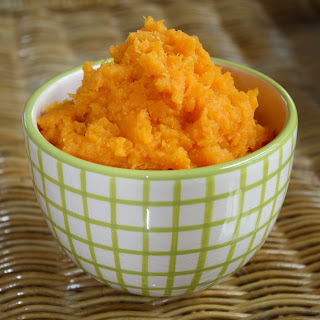 Yeah, mashed sweet potatoes could be a snack! I couldn't stop eating them and it was the middle of the morning when I made them. So there! And even though I altered the original recipe with the addition of some cinnamon, for a little richer flavor, it didn't dull the wonderful zing of the orange juice and zest. In fact, MFH preferred the cinnamon version, but not just because he read an article recently about the health benefits of cinnamon -- anti-inflammatory, anti-microbial, helps regulate blood sugar -- to your daily diet. He must hear what "they" say too. So Kristin, here is your microwavable, vegetarian sweet potato recipe, with an extra healthy dose of all kinds of good things. Hope you like it! Place the sweet potato chunks in a steamer over a large pot of boiling water. Cover and steam until fork-tender – about 12 to 15 minutes. While potatoes are cooking, heat the buttermilk in the microwave for 20 seconds, just to take the away the chill. Do not boil or it will curdle – which is not the end of the world, but the sweet potatoes will have white specks. Drain the potatoes and return them to the pot. Add the warm buttermilk and orange juice; mash until smooth. Stir in the orange zest, nutmeg and cinnamon. Season with salt, as needed. Approximately 160 calories per serving. Note: If you don’t have a stove-top steamer, place the raw sweet potato chunks in a microwave-safe covered casserole and cook on high until softened. Mash sweet potatoes and continue preparation in the casserole dish, as directed in the recipe. What a great idea! I would never have added the orange zest or juice or especially the buttermilk! I've printed out that recipe for the next time I need a little snack! Cottage Girl, this was surprisingly delicious! And it was even better the next day . . . and cold! Wonder what else we can jazz up with orange?